In mid-November I gave a presentation at the SoTL Symposium in Banff, Alberta, Canada, sponsored by Mount Royal University. It’s a little difficult to describe this complex research, so I’ll let my (long) abstract for the presentation tell at least part of the story. There is a good deal of research showing that peer feedback can contribute to improvements in student writing (Cho & MacArthur, 2010; Crossman & Kite, 2012). Though intuitively one might think that students would benefit most from receiving peer comments on their written work, several studies have shown that student writing benefits both from comments given as well as comments received–indeed, sometimes the former more than the latter (Li, Liu & Steckelberg, 2010; Cho & MacArthur, 2011). There are, however, some gaps in the literature on the impact of peer feedback on improving student writing. First, most studies published on this topic consider the effect of peer feedback on revisions to a single essay, rather than on whether students use peer comments on one essay when writing another essay. Cho and MacArthur (2011) is an exception: the authors found that students who wrote reviews of writing samples by students in a past course produced better writing on a different topic than those who either only read those samples or who read something else. In addition, there is little research on what one might call a “dose-response” curve for the impact of peer feedback on student writing—how are the “doses” of peer feedback related to the “response” of improvement in writing? It could be that peer feedback is more effective in improving writing after a certain number of feedback sessions, and/or that there are diminishing returns after quite a few sessions. To address these gaps in the literature, we designed a research study focusing on peer feedback in a first-year, writing intensive course at a large university in North America. In this course students write an essay every two weeks, and they meet every week for a full year in groups of four plus their professor to give comments on each others’ essays (the same group stays together for half or the full year, depending on the instructor). With between 20 and 22 such meetings per year, students get a heavy dose of peer feedback sessions, and this is a good opportunity to measure the dose-response curve mentioned above. We can also test the difference in the dose-response curve for the peer feedback groups that change halfway through the year versus those who remain the same over the year. Further, we can evaluate the degree to which students use comments given by others, as well as comments they give to others, on later essays. While at times researchers try to gauge improvement in student work on the basis of peer feedback by looking at coarse evaluations of quality before and after peer feedback (e.g., Sullivan & Pratt, 1996; Braine, 2001), because many things besides peer feedback could go into improving the quality of student work, more specific links between what is said in peer feedback and changes in student work are preferable. Thus, we will compare each student’s later essays with comments given to them (and those they gave to others) on previous ones, to see if the comments are reflected in the later essays, using a process similar to that described in Hewett (2000). During the 2013-2014 academic year we ran a pilot study with just one of those sections (sixteen students, out of whom thirteen agreed to participate), to refine our data collection and analysis methods. For the pilot program we collected ten essays from each of the students who agreed to participate, comments they received from their peers on those essays, as well as comments they gave to their peers. For each essay, students received comments from three other students plus the instructor. We will use the instructor comments to, first, see whether student comments begin to approach instructor comments over time, and to isolate those things that only students commented on (not the instructor) to see if students use those in their essays (or if they mainly focus on those things that the instructor said also). In this session, the Principal Investigator will report on the results of this pilot study and what we have learned about dealing with such a large data set, whether we can see any patterns from this pilot group of thirteen students, and how we will design a larger study on the basis of these results. It turned out that we were still in the process of coding all the data when I gave the presentation, so we don’t yet have full results. We have coded all the comments on all the essays (10 essays from 13 participants), but are still coding the essays themselves (had finished 10 essays each from 6 participants, so a total of 60 essays). I’m not sure the slides themselves tell the whole story very clearly, but I’m happy to answer questions if anyone has any. I’m saving up writing a narrative about the results until we have the full results in (hopefully in a couple of months!). We’re also putting in a grant proposal to run the study with a larger sample (didn’t get a grant last year we were trying to get…will try again this year). Posted in My presentations, peer assessment & feedback, Scholarship of Teaching and Learning, Teaching and tagged Arts One on November 28, 2015 by Christina Hendricks. I’ve been participating in an open, online course called Human MOOC: Humanizing Online Instruction. It’s officially over now, but I’m just completing a couple of final things from it. One of the sections was on peer review/peer feedback by students of each others’ work. There was a link to a very helpful resource on peer feedback from the teaching and learning centre at Washington University in St. Louis. This page, linked to the previous one, is also very useful: “How to Plan and Guide In-class Peer Review Sessions.” A couple of things struck me about these resources that I wanted to comment on briefly. What rubric/criteria should students use to do peer review? Some instructors ask their students to evaluate their peers’ writing using the same criteria the instructor uses when grading papers (e.g., quality of thesis, adequacy of support, coherence, etc.). Undergraduate students often have an inadequate understanding of these criteria, and as a result, they either ignore or inappropriately apply such criteria during peer-review sessions (Nilson 2003). The role of the peer-reviewer should be that of a reader, not an evaluator or grader. Do not replicate the grading criteria when designing these worksheets. Your students will not necessarily be qualified to apply these criteria effectively, and they may feel uncomfortable if they are given the responsibility to pronounce an overall judgment on their peers’ work. This makes sense, though at the same time it’s troubling because if the students can’t understand the rubrics we use to mark their work, then how can they understand why they got the mark they did, or what they need to do to improve? It seems to me the answer here is not to ask students to use a different rubric when doing peer review than what we use to mark, but changing the rubric we use to mark so that it makes more sense to students (if there are comprehension problems). Now, I haven’t read the work by Nilson cited above, but it would be interesting to look more carefully into what undergraduate students tend to understand or not understand, or why, and then change one’s rubric accordingly. One way one might do this, perhaps, is to ask them to use one’s marking rubric to evaluate sample essays and then invite feedback on the rubric as/after they are doing this. Then one can maybe catch some of the things students don’t understand before one uses the rubric for marking the essays? The second resource suggests that one holds a mock session to begin with, which seems an excellent idea. It connects with the importance of training students in peer review before asking them to engage in it on work for the course (as discussed in Sluijsmans et al., 2002). The idea would be to give them a “fake” essay of a kind similar to what they need to write, give them the peer review worksheet, and ask them to come up with comments on the paper. This can be done individually or in groups. Then, in class, have students give their comments to the whole group and the instructor writes them down on something that can be shown on the screen (or, alternatively, one could have them write the comments on a shared document online so they could be projected easily and the instructor doesn’t have to re-write them!). Then the class can have a discussion on the essay, the comments, and the marking worksheet/rubric, to clear up any confusion or help students improve their comments–e.g., moving from “good introduction” to saying what about the introduction is good, in particular. This is an excellent idea, and I’m going to incorporate it in my upcoming philosophy class this summer. In Arts One we meet every week to do peer review of essays, in groups of four students plus the prof, so we can help students learn how to do peer review well on an almost one-to-one basis. And, since they do it every week for a year, they get quite good at it after awhile, even a very short time, actually! I could have sworn that the resources linked above from Washington University also talked about the value of students doing self-assessment of their own work, but now I can’t find that on those pages. But I was thinking that after they do peer feedback on each others’ work, it would be useful for them to go back to their own work and give feedback on it. It seems to me that after reading and commenting on others’ work, seeing what works/what doesn’t work, one could come to one’s own with fresh eyes, having learned from others’ work and also having distanced oneself from one’s own a bit. I think I’ll try asking students to submit the peer review worksheet on their own essays after doing the peer feedback on others’, when they turn in their drafts post-peer-feedback. Nilson, Linda. (2003). “Improving Student Peer Feedback.” College Teaching, 51 (1), p. 34-38. Posted in peer assessment & feedback and tagged #HumanMOOC on April 11, 2015 by Christina Hendricks. So, this is kind of exciting for me. I’ve been mentioned in some articles and blog posts, and even interviewed! First, as a result of my presentation at the Open Education Conference 2014 in Washington, DC, I was interviewed by Jenni Hayman of the Open Policy Network about UBC’s Policy 81. You can see a video recording of this interview, which was done via Skype, on the OPN blog. Most recently, there was a writeup of my research on peer feedback on writing, on the BCcampus website. And then there was an article about the three Faculty Fellows (including me) with the BCcampus Open Textbook program for 2014-2015. So it’s not the New York Times or even the CBC, but hey, it’s a start. Posted in Open Access, open ed, OER, peer assessment & feedback and tagged policy 81 on February 18, 2015 by Christina Hendricks. I attended the biannual meeting of the American Association of Philosophy Teachers July 30-Aug 2, 2014, and got some fantastic suggestions/ideas for future teaching, as I did the last time I attended this conference. The AAPT workshop/conference is easily one of my top favourite conferences: it is so friendly, inviting, supportive, and there are great people to talk to about teaching philosophy as well as about life in general. I haven’t laughed this much, for so many days in succession, for a long time. It’s too bad this meeting is only held every two years, as these are people I’d sure like to see more often! I’m going to take a few of blog posts to write down some of the (many) things that inspired me at this conference, that I’d like to try in my own teaching one way or another. There were many more things than I’m going to write about here—I have pages and pages of notes that I typed out during the conference. But in this and a couple of future posts, I’ll focus on just a few. 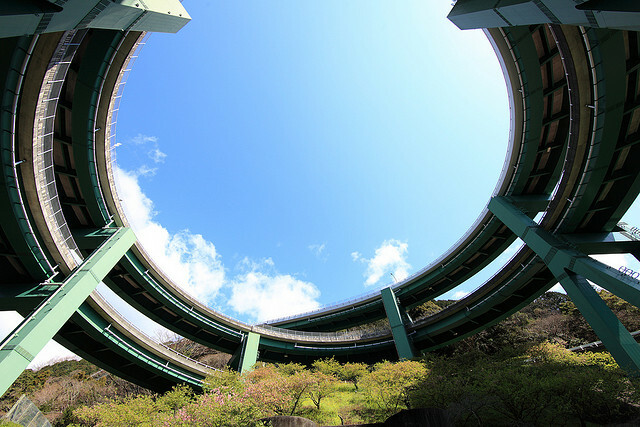 Broken feedback loop: when did you not respond well to feedback? Rebecca Scott from Loyola University Chicago facilitated a session on closing the feedback loop, which started off in a really helpful way: she asked us to consider (among other things) times when we received feedback from someone (whether in the context of our academic lives or other aspects of our lives) and didn’t respond in the way that we now think would be most helpful. I won’t give details on either situation, but one of them had to do with feedback I received at the end of a course that utterly shocked and floored me. More than one student said that I did something that was so very far from who I think I am that I just couldn’t believe it was true. All I could think of was: “How could someone think I was doing that? There’s no way I did that! They must be wrong.” I didn’t entertain (at first) the idea that the feedback could be right in some way. It just didn’t fit with who I thought I was. Remembering this situation helped put me into the mindset of students receiving critical feedback (or, at least, helped move me closer to that I hope), and not believe it, getting angry, indignant, even lashing out. When that happens you are not even allowing yourself to think that the feedback might be true; since it doesn’t fit with who you think you are, your own evaluation of the quality of your work, the truth must be that whoever said that is simply wrong. I’m reminded of Socrates who, at least in Plato’s texts, would show his interlocutors that they didn’t know what they thought they knew, and for some the reaction was to just assume that Socrates must be wrong and to get angry with him. Why might feedback not be incorporated into future work? The one that I find hardest to deal with (though many are quite challenging) is the first: the emotional reaction. It kept me from addressing my situation as well as I could have, and I can see how student emotional reactions could lead them to not want to even look at the feedback again or think about it at all. Rebecca shared with us an assignment she gives to students that asks them to reflect on their feedback, that forces them to read it and consider it and reflect on what they want to change for the future based on it. And the first item on that assignment is a question, asking them what their immediate reaction was on receiving the feedback. The idea is that maybe if they have an outlet to write it down, to let you know their emotional reaction, this might help them move past it. How might all of this help with the emotional reaction issue? Besides making them continue to think about the feedback even if they get angry instead of just ignoring it, it also gives them a chance to give feedback on the feedback, to try to figure out what could explain the difference between the grade they expected and the grade they got, which could include thinking about the feedback and how it might suggest that the grade makes at least some sense. Or, if they disagree with the feedback, it gives them an outlet to do so, and the instructor can follow up with them later to discuss the issue. I like this idea of a reflection on the feedback that you submit to the instructor, but I also want them to have a kind of running record of the feedback they’ve received, the 2-3 things they want to work on for the next time, what they did well and want to keep doing, etc. In addition, I want to make sure that they have to look back at this feedback for the next paper they write. Point out at least one other place in the previous essay where one of the comments I made applies elsewhere too. 3. Finally, I think it would be great if they could keep a learning log, digitally, where they keep track of, for each essay: the comments they’ve gotten from peers, at least two things from me that they want to work on, the things they’re doing well and want to keep doing. That way they have a running record and periodically I can ask them to reflect on whether there are any patterns/repeated comments, or whether they are getting better because certain sorts of comments aren’t being said anymore. These things could hopefully all help with the issue of not connecting feedback on previous work to later work. But I have to figure out how much of this is adding too much work for the students, or whether it is all so pedagogically valuable as to be worth it. At first, I just shut down. So I can understand when students do that. I didn’t want to think about it and just wanted to move past it. But I did eventually do something: I emailed all my students and asked them to fill in another feedback form, anonymously, that would just go to me. I asked them to be as specific as possible, because I didn’t get quite enough details on the first one. I got a few more details on this second round, which helped me understand some of the concerns expressed and how students may have come to the conclusion they did (and even that I might have been unconsciously doing some of what they thought, even though I’m still reluctant to believe that). But not entirely fully. I think there was some miscommunication somewhere that I just can’t rectify now. Posted in Assignments, Instructor feedback, peer assessment & feedback, Reflections on my own teaching on August 5, 2014 by Christina Hendricks. I have been doing quite a few “research reviews” of articles on peer assessment–where I summarize the articles and offer comments about them. 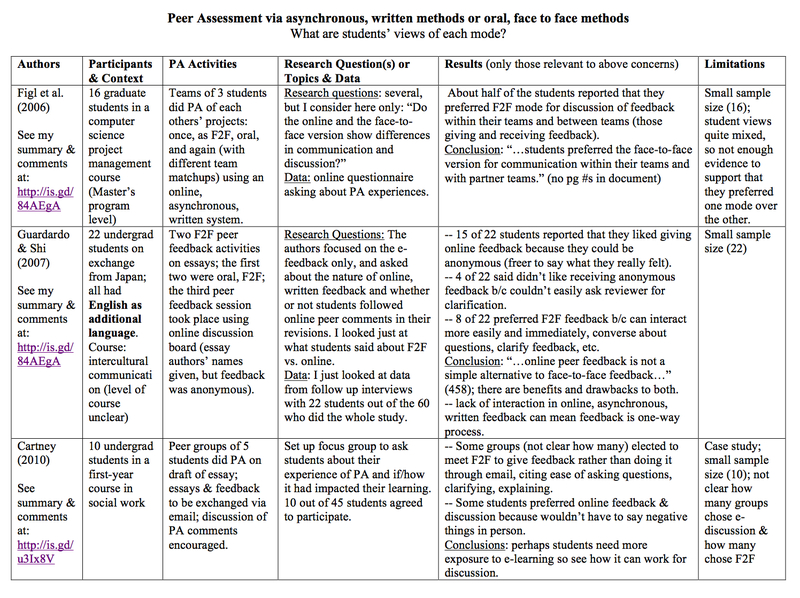 Lately I’ve been reading articles on different modes of peer assessment: written, oral, online, face to face, etc. And here, I am going to try to put together what that research has said to see if anything can really be concluded about these issues from it. 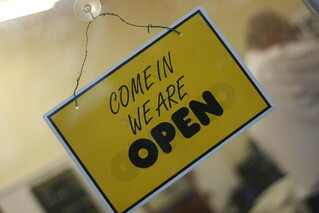 In what follows, I link to the blog posts discussing each article. Links to the articles themselves can be found at the bottom of this post. I created PDF tables to compare/contrast the articles under each heading. They end up being pretty small here on the blog, so I also have links to each one of them, below. This is the dichotomy I am most interested in: is there a difference when feedback is given asynchronously, in a written form, or when given synchronously, as spoken word face to face? Does the feedback itself differ? Might one form of feedback be more effective than another in terms of being taken up in later revisions of essays? 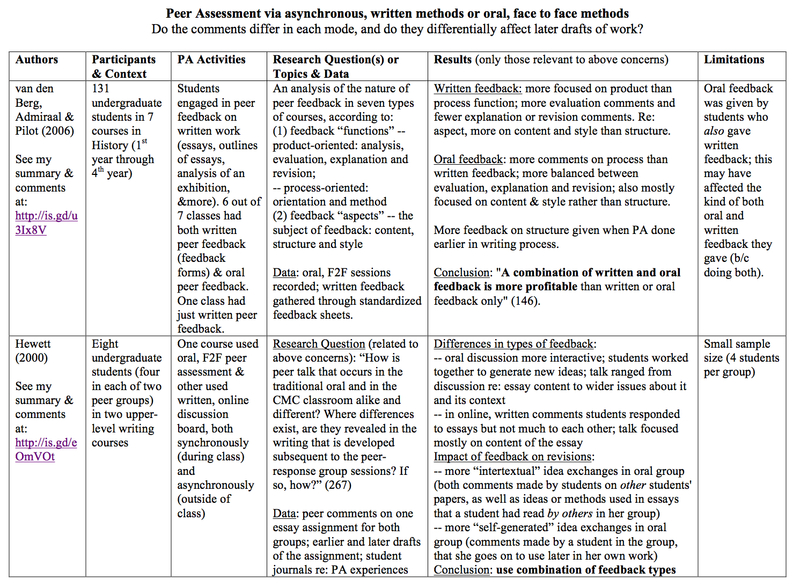 Do the comments differ in the two modes of peer feedback, and are they used differently in later drafts? The PDF version of the table below can be downloaded here. van den Berg, Admiraal and Pilot (2006) looked at differences in what was said in peer feedback on writing assignments when it was written (on standardized peer feedback forms, used for the whole class) and when it was given in oral, face to face discussions. They found that written feedback tended to be more focused on evaluating the essays, saying what was good or bad about them, and less on giving explanations for those evaluative comments or on providing suggestions for revision (though this result differed between the courses they analyzed). In the oral discussions, there was more of a balance between evaluating content, explaining that evaluation, and offering revisions. They also found that both written and oral feedback focused more on content and style than on structure, though there were more comments on structure in the written feedback than in the oral. The authors note, though, that in the courses in which peer feedback took place on early drafts or outlines, there was more feedback on structure than when it took place on later drafts. They conclude: “A combination of written and oral feedback is more profitable than written or oral feedback only” (146). Hewett (2000) looked at differences in peer feedback between an oral, face to face environment and an electronic, text-based environment. She found that the talk in the oral communication was much more interactive, with students responding to each others’ comments, giving verbal cues that they were following along, and also working together to generate new ideas. The text-based, online feedback was much less like a conversation, with students commenting on the papers at hand but not interacting very much with each other. Perhaps unsurprisingly, then, while the feedback in the written environment was mostly focused on the content of the essay being evaluated, the discussion in the oral environment ranged more widely. Hewett also analyzed essay drafts and peer comments from both environments to see if the peer discussion and comments influenced later drafts of essays. She found that in the oral environment, there was more use in students’ work of ideas that came up in the peer discussion about others’ essays, or that one had oneself said. Hewett concludes that a combination of oral discussion and asynchronous, written comments would be good, using the former for earlier stages of writing–since in oral discussion there can be more talk in which students speculate about wider issues and work together to come up with new ideas–and the latter for revisions focused more on content. What are students’ views of each mode? A PDF version of the following table can be downloaded here. Figl et al. (2006) surveyed students in a computer science course who had engaged in peer assessment of a software project in both the face to face mode as well as through an online, asynchronous system that allows for recording of criticisms as well as adding comments as in a discussion board. There wasn’t a clear preference for one mode over another overall, except in one sense: about half of the students preferred using the face to face mode for discussion within their own teams, and with their partner teams (those they are giving feedback to and receiving feedback from). There was not as much discussion of the feedback, whether within the team or with the partner teams, in the online format, students reported, and they valued the opportunity for that discussion. Figl et al. conclude that it would be best to combine online, asynchronous text reviews with face to face activities, perhaps even with synchronous chat or voice options. The study reported in Guardardo & Shi 2007 focused on asynchronous, written feedback for the most part; the authors recorded online, discussion-board feedback on essays and compared that with a later draft of each essay. They wanted to know if students used or ignored these peer comments, and what they thought of the experience of receiving the asynchronous, written feedback (they interviewed each student as well). All of the students had engaged in face to face peer feedback before the online mode, but the face to face sessions were not recorded so the nature of the comments in each mode was not compared. Thus, the results from this study that are most relevant to the present concern are those that come from interviews, in which the students compared their experiences of face to face peer feedback with the online, written, asynchronous exchange of feedback. Results were mixed, as noted in the table, but quite a few students said they felt more comfortable giving feedback without their names attached, while a significant number of students preferred the face-to-face mode because it made interacting with the reviewer/reviewee easier. The authors conclude that “online peer feedback is not a simple alternative to face-to-face feedback and needs to be organized carefully to maximize its positive effect” (458). Cartney 2010 held a focus group of ten first-year students in a social work course who had engaged in a peer feedback exercise in which essays and comments on essays, as well as follow up discussion, was to take place over email. Relevant to the present concern is that the focus group discussion revealed that several groups did not exchange feedback forms via email but decided to meet up in person instead in order to have a more interactive discussion. Some groups did exchange written, asynchronous, online feedback, citing discomfort with giving feedback to others to their “faces.” The author concludes that there may be a need to use more e-learning in curricula in order for students to become more accustomed to using it for dialogue rather than one-way communication. But I also see this as an indication that some students recognized a value in face to face, oral, synchronous communication. This dichotomy contrasts two sorts of synchronous methods for peer feedback and assessment: those taking place online, through text-based systems such as “chats,” and those taking place face to face, orally. Do comments given synchronously through text-based chats differ from those given orally, face to face? And do these two modes of commenting affect students’ revisions of work differently? A PDF version of both of the tables below can be downloaded here. Sullivan & Pratt 1996 looked at two writing classes: in one class all discussions and peer feedback took place through a synchronous, electronic, text-based chat system and in the other discussions and peer feedback took place face to face, orally. They found that writing ability increased slightly more for the computer-assisted class over the traditional class, and that there were differences in how the students spoke to each other in the electronic, text-based chat vs. face to face, orally. The authors stated that the face to face discussion was less focused on the essay being reviewed than in the online chats (but see my criticisms of this interpretation here). They also found that the electronic chats were more egalitarian, in that the author did not dominate the conversation in them in the same way as happened with the face to face chats. The authors conclude (among other things) that discussions through online chats may be beneficial for peer assessments, since their study “showed that students in the computer-assisted class gave more suggestions for revision than students in the oral class” (500), and since there was at least some evidence for greater writing improvement in the “chat” class. Braine 2001 (I haven’t done an earlier summary of this article in my blog) looked at students in two different types of writing classes in Hong Kong (in English), similar to those discussed in Sullivan & Pratt (1996), in which one class has all discussions and peer assessment taking place orally, and the other has these taking place on a “Local Area Network” that allows for synchronous, electronic, text-based chats. He looked at improvement in writing between a draft of an essay and a revision of that essay (final version) after peer assessment. Braine was testing students’ ability to write in English only, through the “Test of Written English.” He found that students’ English writing ability improved a bit more for the face-to-face class than the computer-mediated class, and that there were significant differences in the nature of discussions in the two modes. He concluded that oral, face-to-face discussions are more effective for peer assessment. Liu & Sadler 2003 contrasted two modes of peer feedback in two composition classes, one of which wrote comments on essays by hand and engaged in peer feedback orally, face to face, and the other wrote comments on essays digitally, through MS Word, and then engaged in peer discussion through an electronic, synchronous, text-based chat during class time. The authors asked about differences in these modes of commenting, and whether they had a differential impact on later essay revisions. Liu & Sadler were not focused on comparing the asynchronous commenting modes with the synchronous ones, but their results show that there was a higher percentage of “global” comments in both of the synchronous modes, and a higher percentage of “local” comments in the asynchronous ones. They also found that there was a significantly higher percentage of “revision-oriented” comments in the oral discussion than in the electronic chat. Finally, students acted more often on the revision-oriented comments given in the “traditional” mode (handwritten, asynchronous comments plus oral discussion) than in the computer-mediated mode (digital, asynchronous comments plus electronic, text-based chat). They conclude that for asynchronous modes of commenting, using digital tools is more effective than handwriting (for reasons not discussed here), and for synchronous modes of commenting, face to face discussions are more effective than text-based, electronic chats (219-221). They suggest combining these two methods for peer assessment. Jones et al 2006 studied interactions between peer tutors in an English writing centre in Hong Kong and their clients, both in face to face meetings and in online, text-based chats. This is different from the other studies, which were looking more directly at peer assessment in courses, but the results here may be relevant to what we usually think of as peer assessment. The authors were looking at interactional dynamics between tutors and clients, and found that in the face-to-face mode, the relationship between tutors and clients tended to be more hierarchical than in the electronic, online chat mode. They also found that the subjects of discussion were different between the two modes: the face-to-face mode was used most often for “text-based” issues, such as grammar and word choice, while in the electronic chats the tutors and clients spoke more about wider issues such as content of essays and process of writing. They conclude that since the two modes differ and both serve important purposes, it would be best to use both modes. This set of studies is not the result of a systematic review of the literature; I did not follow up on all the other studies that cited these, for example. A systematic review of the literature might add more studies to the mix. In addition, there are more variables that should be considered (e.g., whether the students in the study underwent peer assessment training, how much/what kind; whether peer assessment was done using a standardized sheet or not in each study, and more). Nevertheless, I would like to consider briefly if these studies provide any clarity for direction regarding written peer assessment vs. oral, face-to-face. For written, asynchronous modes of peer assessment (e.g., writing on essays themselves, writing on peer assessment forms) vs. oral, face-to-face modes, the studies noted here (van den Berg, Admiraal and Pilot (2006) and Hewett (2000)) suggest that in these two modes students give different sorts of comments, and for a fuller picture peer assessment should probably be conducted in both modes. Regarding student views of both modes (Figl et al. (2006), Guardardo & Shi (2007), Cartney (2010)), evidence is mixed, but there are at least a significant number of students who prefer face-to-face, oral discussions if they have to choose between those and asynchronous, written peer assessment. 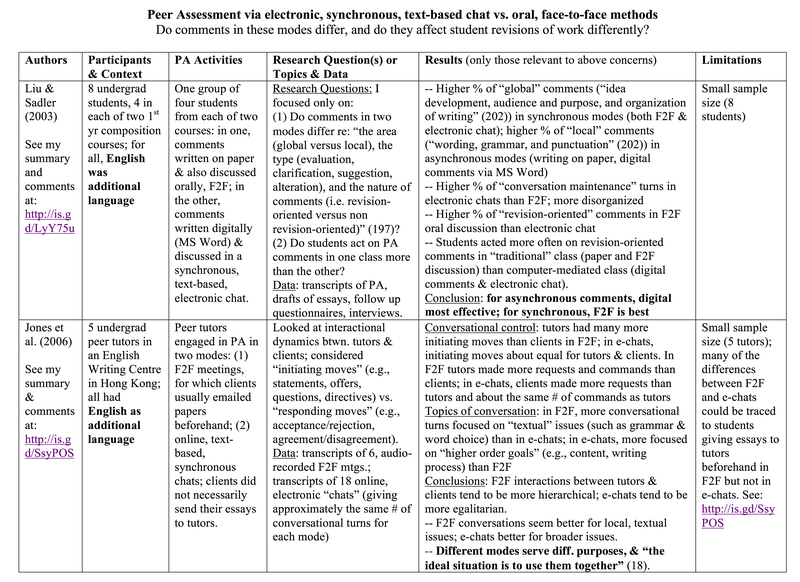 For written, synchronous modes of peer assessment (e.g., electronic, text-based chats) vs. oral, face-to-face, the evidence here is all from students for whom English is a foreign language, but some of the results might still be applicable to other students (to determine this would require further discussion than I can engage in now). All that can be said here is that the results are mixed. Sullivan & Pratt (1996) found some, but not a lot of evidence that students using e-chats improved their writing more than those using oral peer assessment, but Braine (2001) found the opposite. However, they were using different measures of writing quality. Sullivan & Pratt also concluded that the face-to-face discussions were less focused and effective than the e-chat discussions, while Braine concluded the opposite. This probably comes down in part to interpretation of what “focused” and “effective” mean. Liu & Sadler (2003) argued that face-to-face modes of synchronous discussion are better than text-based, electronic, synchronous chats–opposing Sullivan & Pratt–because there was a higher percentage of “revision-oriented” conversational turns (as a % of total turns) in the face-to-face mode, and because students acted on the revision-oriented comments more in the traditional class (both writing comments on paper and oral, face-to-face peer discussion) than in the computer-mediated class (digital comments in MS Word and e-chat discussions). Jones et al. (2006) found that students and peer tutors talked about different types of things, generally, in the two modes and thus concluded that both should be used. But that study was about peer tutors and clients, which is a different situation than peer assessment in courses. So really, little can be concluded, I think, from looking at all these studies, except that it does seem that students tend to say different types of things in different modes of communication (written/asynchronous, written/synchronous, oral/face-to-face/synchronous), and that those things are all valuable; so perhaps what we can say is that using a combination of modes is probably best. Besides more studies to see if better patterns can emerge (and perhaps they are out there–as noted above, my literature search has not been systematic), one gap is that no one, so far, has considered video chats, such as Google Hangouts, for peer assessment. Perhaps the differences between those and face-to-face meetings might not be as great as between face-to-face meetings and text-based modes (whether synchronous chats or asynchronous, written comments). And this sort of evidence might be useful for courses that are distributed geographically, so students could have a kind of face-to-face peer assessment interaction rather than just giving each other written comments and carrying on a discussion over email or an online discussion board. Of course, the problem there would be that face-to-face interactions are best if supervised, even indirectly, so as to reduce the risk of people treating each other disrespectfully, or offering criticisms that are not constructive. So, after all this work, I’ve found what I had guessed before starting: it’s probably best to use both written, asynchronous comments and oral, face-to-face comments for peer assessment. Figl, K., Bauer, C., Mangler, J., Motschnig, R. (2006) Online versus Face-to-Face Peer Team Reviews, Proceedings of Frontiers in Education Conference (FIE). San Diego: IEEE. See here for online version (behind a paywall). Posted in peer assessment & feedback, Scholarship of Teaching and Learning and tagged Research Reviews, student writing on March 5, 2013 by Christina Hendricks. Here I look at one last study I’ve found that focuses on the nature of student peer feedback discussions when they take place in a synchronous, online environment (a text-based chat). Part 1 corresponding to this post can be found here. This study is rather different than the ones I looked at in Part 1 of face to face vs. online, synchronous peer assessment, because here the subjects of the study are students and peer tutors in a writing centre rather than peers in the same course. Still, at least some of their results regarding the nature of peer talk in the tutor situation may still be relevant for peer assessment in courses. The Tutoring Centre, by Tulane Public Relations, on Flickr. CC-By licensed. The participants in this study were five peer tutors in a writing centre in Hong Kong, dedicated to helping non-native English speakers write in English. For both tutors and clients, English was an additional language, but the tutors were further along in their English studies and had more proficiency in writing in English than the clients. Data was collected from transcripts of face to face consultations of the tutors with clients, as well as transcripts of online, text-based chat sessions of the same tutors, with many of the same clients. Face to face tutoring was only available in the daytime on weekdays, so if students wanted help after hours, they could turn to the online chat. Face to face sessions lasted between 15 and 30 minutes, and students “usually” emailed a draft of their work to the tutor before the session. Chat sessions could be anywhere from a few minutes to an hour, and though tutors and clients could send files to each other through a file exchange system, this was only done “sometimes” (6). These details will become important later. To analyze the interactions between tutors and clients, the authors used a model based on “Halliday’s functional-semantic view of dialogue (Eggins & Slade, 1997; Halliday, 1994)” (4). In this model, one analyzes conversational “moves,” which are different than “turns”–a “turn” can have more than one “move.” The authors explain a move as “a discourse unit that represents the realization of a speech function” (4). They then subdivide these two categories further, some of which is discussed briefly below. In the face to face meetings, the tutors exerted the most control over the discussions. Tutors had many more initiating moves (around 40% of their total moves, vs. around 10% of those for clients), whereas clients had more responding moves (around 33% of clients’ total moves, vs. about 14% for tutors). In the chat conversations, on the other hand, initiating and responding moves were about equal for both tutors and clients (7). However, the authors also point out that even though the clients asserted more conversational control in the online chats, it was “typical” of the chats to consist of questions by students asking whether phrases, words, or sentences were “correct” (11). They did not often ask for explanations, just a kind of check of their work from an expert and a quick answer as to whether something was right or wrong. On the other hand, when tutors controlled the conversations with their questions, it was often the case that they were using strategies to try to get clients to understand something themselves, to understand why something is right or wrong and to be able to apply that later. So “control” over the conversation, and who asks the most questions or issues the most directives, are not the only important considerations here. In the face to face sessions, tutors used more closed questions (about 50% of their initiating questions) than open questions (about 33%); the opposite was true in the online chats: tutors used more open questions (about 50% of their initiating questions) than closed (about 41%). Posted in peer assessment & feedback, Scholarship of Teaching and Learning and tagged Research Reviews, student writing on February 26, 2013 by Christina Hendricks. This is another post in the series on research literature that looks at the value of doing peer assessment/peer feedback in different ways, whether face to face, orally, or through writing (mostly I’m looking at computer-mediated writing, such as asynchronous discussion boards or synchronous chats). Earlier posts in this series can be found here, here, here and here. In this post I’ll look at a few studies that focus on peer assessment through online, synchronous discussions (text-based chats). 38 second-year university students studying English writing for the first time (where English was an additional language) participated in the study. They were distributed in two classes taught by the same professor, where all the teaching materials were the same except that in one class all class discussions and peer evaluation discussions were held orally, face to face, and in the other all class discussions and peer group discussions were held online, in a synchronous “chat” system. 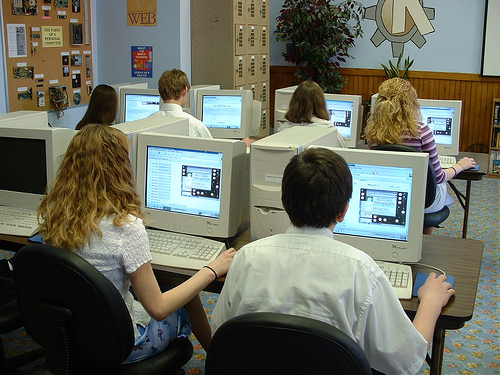 In the computer-assisted class, students met often in a computer lab, where they engaged in whole-class discussions and peer group discussions using the chat system. (2) Is the nature of the participation and discourse in the two modes of communication different? In what follows I will only look at the last part of question 1 (the overall quality of writing), as well as question 2. At the beginning of the term, students produced a writing sample based on a prompt given by the instructor. This was compared with a similar writing sample given at the end of the term. These were “scored holistically on a five point scale by two trained raters” (494). In the oral class, strangely, the writing scores went down by the end of the term: at the beginning the mean was 3.41 (out of 5), with a standard deviation of 0.77, and at the end it was 2.95 with a SD of 0.84. The authors do not comment on this phenomenon, though the difference (0.46) is not great. In the computer class, the writing scores went up slightly: from a mean of 3.19 (SD 0.77) at the beginning to 3.26 (SD 0.70) at the end. The authors note, though, that “[t]he students in the two classes did not differ significantly (below the 0.05 probability level) at the beginning nor at the end of the semester” (496). The authors conclude, however, that the data does not support saying one environment is better than another in terms of improving writing (nor, incidentally, for the rest of research question (1), above). There were more comments made in the oral class, during peer assessment discussions, than in the online chat groups: 40-70 turns per group for the oral discussions and 14-25 turns per group for the online chats (498). However, the authors found that the discussion in the oral class was, as they put it, “less focused” (498), in the sense that there were more interjections of personal narratives and repetitions of what other students had said. In the computer class, the talk was more “focused on the task of criticizing the writing rather than conversing with their fellow students while on the network” (499). The tone of the article here indicates that the talk in the online chat was better than that in the oral discussion. But as noted in Hewett (2000), the sort of talk that might be interpreted as “unfocused” could also be interpreted as an important part of participating in an interactive discussion. Repetitions indicate that one is listening, following along, and being an engaged participant in a discussion. Personal narratives can both help to make a point as well as forge some connections between discussion group members, perhaps bringing them closer together and thereby helping them feel more comfortable (which could contribute to more productive peer evaluation). In addition, in the oral groups the author of the paper being discussed often dominated the discussion, while the author spoke less in the online chats, making for more equal participation. Posted in peer assessment & feedback, Scholarship of Teaching and Learning and tagged Research Reviews, student writing on February 20, 2013 by Christina Hendricks. This is part of a series of posts in which I summarize and comment on research literature about different methods of doing peer assessment. Earlier posts in this series can be found here and here, and part 1 corresponding to this particular post is here. In this post I summarize, as briefly as I can, a complex study on differences between how students speak to each other when doing peer assessment when it’s in person versus on a discussion board (mostly asynchronous, but students also did some posting to the discussion boards in a nearly synchronous environment, during class time). This study looked at differences between ways peers talk in face to face environments and computer-mediated environments (abbreviated in the article as CMC, for computer-mediated communication). It also looked at whether there are differences in the ways students revise writing assignments after these different modes of peer assessment and feedback. Students in two sections of an upper-level course (Argumentative writing) at a four-year university participated; one section engaged in face to face peer assessment, and the other used computer-mediated peer assessment, but otherwise the two course were the same, taught by the same instructor. The CMC course used a discussion board system with comments organized chronologically (and separated according to the peer groups), and it was used both during class, synchronously (so students were contributing to it while they were sitting in a class with computers) and outside of class, asynchronously. Peer group conversations were recorded in the face to face class, and the record of conversations from the CMC class could just be downloaded. The author also collected drafts of essays on which the peer discussion took place. Data was collected from all students, but only the recordings of conversations in one peer group in each class (oral and CMC) were used for the study. I’m not sure how many students this ended up being–perhaps 3-4 per peer group? [update (Feb. 28, 2013)] Looking at the article again, a footnote shows that there were four students in each group. One of those groups, the CMC group, engaged in both computer-mediated peer discussion as well as oral discussion at a later point–so this group provides a nice set of data about the same people, discussing together, in two different environments. Below, when talking about the “oral” groups, the data include the group that was in the oral only class, plus the CMC group when they discussed orally. Not surprisingly, the student discussion in the face to face groups was highly interactive; the students’ statements often referred to what someone else had said, asked questions of others, clarified their own and others’ statements, and used words and phrases that cued to others that they were listening and following along, encouraging dialogue (e.g., saying “yes,” “right,” “okay,” “exactly”) (269-270). In the CMC discussions, the talk was less interactive. Multiple threads of discussion occurred on the board, and each students’ comments could pick up on several at a time. This created a “multivocal tapestry of talk” that individuals would have to untangle in order to participate (270). At times, students in a peer group would respond to the paper being discussed, but not to each other (271), so that the comments were more like separate, standalone entities than part of an interactive conversation. In addition, the possibility for asynchronous communication, though it could be convenient, also left some students’ comments and questions unanswered, since others may or may not return to the board after the synchronous group “chat” time had ended. Hewett found that face to face discussion had more talk about ideas, wider issues raised in the papers, and information about the contexts surrounding the claims and issues discussed in the papers, than in the CMC discussion (276). The CMC groups tended to focus more on the content of what was written, and showed less evidence of working together to develop new ideas about the topics in the essays. Hewett suggests: “Speculative thinking often involves spinning fluid and imperfectly formed ideas; it requires an atmosphere of give-and-take and circumlocution,” which is more characteristic of oral speech (276). Posted in peer assessment & feedback and tagged Research Reviews, student writing on February 11, 2013 by Christina Hendricks. I have been doing a good deal of reading research on peer assessment lately, especially studies that look at differences and benefits/drawbacks of doing peer assessment face to face , orally, and through writing–both asynchronous writing in online environments (e.g., comments on a discussion board) and synchronous writing online (e.g., in text-based “chats”). 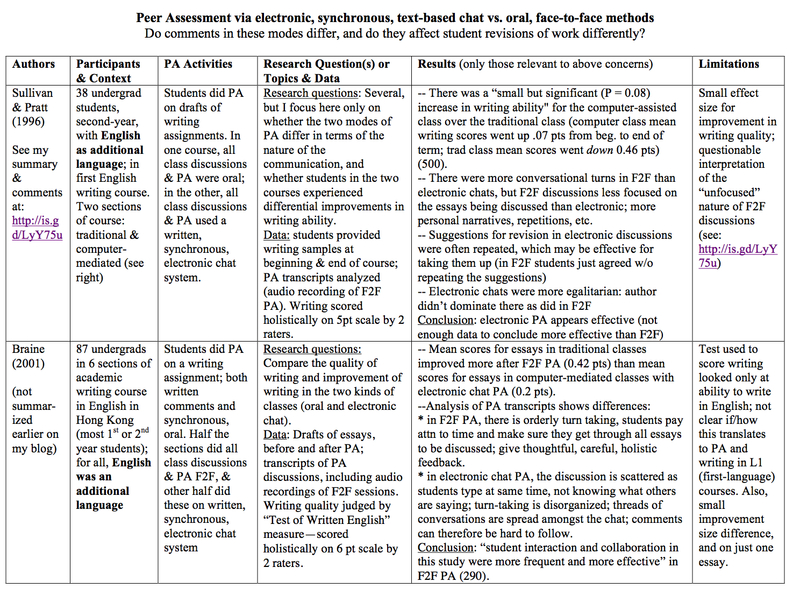 I summarized a few studies on oral vs. written peer assessment in this blog post, and then set out a classification structure for different methods of peer assessment in this one. Here, I summarize a few studies I’ve read that look at written, online, asynchronous peer feedback. In another post I’ll summarize some studies that compare oral, face to face with written, online, synchronous (text-based chats). I hope some conclusion about the differences and the benefits of each kind can be drawn after summarizing the results. This study is a little outside of my research interest, as it doesn’t compare oral feedback to written (in any form). Rather, the research focus was to look at how students revised essays after receiving e-feedback from peers and their teacher. Oral feedback was only marginally part of the study, as noted below. 20 L2 students (students for whom English was an additional language) in a first-year writing course at a four-year university participated in this study. Paper drafts were uploaded onto a website where other students could read them and comment on them. The e-feedback could be read on the site, but was also sent via email to students (and the instructor). Students wrote four papers as part of the study, and could revise each paper up to five times. 97 first drafts and 177 revisions were analyzed in the study. The author compared comments received digitally to later revised drafts, to see what had been incorporated. He also interviewed the authors of the papers to ask what sparked them to make the revisions they did. Tuzi combined the results from analyzing the essay drafts and e-feedback (to see what of the feedback had been incorporated into revisions) with the results of the interviews with students, to identify the stimuli for changes in the drafts. From these data he concludes that 42.1% of the revisions were instigated by the students themselves, 15.6% from e-feedback, 148.% from the writing centre, 9.5% from oral feedback (from peers, I believe), and for 17.9% of the revisions, the source was “unknown.” He also did a few finer-grained analyses, showing how e-feedback fared in relation to these other sources at different levels of writing (such as the punctuation, word, sentence, paragraph), in terms of the purpose of the revision (e.g., new information, grammar) and more. In many analyses, the source of most revisions was the students themselves, but e-feedback ranked second some (such as working at the sentence, clause and paragraph levels, and adding new information). Oral feedback was always low on the list. Although e-feedback is a relatively new form of feedback, it was the cause of a large number of essay changes. In fact, e-feedback resulted in more revisions than feedback from the writing center or oral feedback. E-feedback may be a viable avenue for receiving comments for L2 writers. Another interesting observation is that although the L2 writers stated that they preferred oral feedback, they made more e-feedback-based changes than oral-based changes. True, but note that in this study oral feedback was not emphasized. It was something students could get if they wanted, but only the e-feedback was focused on in the course. So little can be concluded here about oral vs. e-feedback. To be fair, that wasn’t really the point of the study, however. The point was simply to see how students use e-feedback, whether it is incorporated into revisions, and what kinds of revisions e-feedback tends to be used for. And Tuzi is clear towards the end: “Although [e-feedback] is a useful tool, I do not believe it is a replacement for oral feedback or classroom interaction …”. Different means of feedback should be available; this study just shows, he says, that e-feedback can be useful as one of them. Posted in peer assessment & feedback, Scholarship of Teaching and Learning and tagged Research Reviews, student writing on February 10, 2013 by Christina Hendricks. In an earlier post I summarized a few studies of peer assessment/peer feedback, and since then I’ve done some more research and found several more studies. What I also realized is that “oral vs written peer feedback” is not an adequate description of the myriad options. There is also synchronous vs. asynchronous, and face-to-face vs. mediated (often computer mediated). So, written feedback can be asynchronous or synchronous (such as with online “chats”), and done on paper or computer mediated (typed digitally and emailed or uploaded into some online system that allows students to retrieve the comments on their papers). Oral feedback, in turn, can be face-to-face or computer mediated, and the latter can be asynchronous (such as recorded audio or video) or synchronous (such as real-time video or audio chatting). Oral, asynchronous, face-to-face feedback situation are probably unlikely to happen very often, such as showing videos of one’s feedback to another person in person (or doing the same with an audio recording). Written, face-to-face, synchronous feedback by itself is likely also rare, since it’s more probable that students will be writing comments on each others’ papers in each others’ presence while also discussing comments together–in which case the situation would be a blend of written, face-to-face, synchronous and oral, face-to-face, synchronous. Also, I’m not really sure about the written, face-to-face, asynchronous box; that is only face-to-face insofar as the comments are given to the peer face-to-face, on paper. The reason why I’m taking the time to distinguish these various permutations is that the literature I’ve been reading lately falls into various boxes on the table. For example, Reynolds and Russell (2008) (see this post) would fall into the oral, computer-mediated, asynchronous box. Most of the literature that talks about “oral” feedback is talking about oral, face-to-face, synchronous feedback (as I was using the term “oral” before now). — though maybe written face-to-face is rare enough that this could just be FTF? Posted in peer assessment & feedback and tagged student writing on February 4, 2013 by Christina Hendricks.